ARTBA, of course, has a stake in the outcome of the threatened repeal of S.B. 1, since many of the jobs created by the measure are going to its members. Still, the reports it commissioned on the economic impacts of the gas tax increase are a compelling argument in favor of investing in infrastructure. The original report, available here, was released in February, and yesterday ARTBA released several new reports focused on specific regions of the state. Its analysis evaluates the economic benefits to individuals and the state, including new jobs, savings on vehicle repairs, and cost savings from improved safety conditions. It also includes increased economic activity from purchasing materials, in-state spending on goods and services by those with new jobs and new business, and additional income and sales tax revenue to the state. S.B. 1 is expected to bring in an average of $5.2 billion annually over the next decade in increased revenue from gas taxes and fees, so the report’s estimate of $18.3 billion annually in direct and indirect benefits to the state’s economy and its residents is a pretty big return. The report estimates there will be new jobs in many sectors, not just transportation and construction, including agriculture, mining, utilities, manufacturing, trade, information, real estate, health care, and others. The report also outlines other less easily quantified benefits, such as quality of life, safety and comfort levels for all road users, and improvements in cities and towns. The report goes into detail about why and how these investments improve overall state economic health, including increasing access to goods and services, reducing production costs, increased efficiencies, better emergency management, fostering innovation, and the like. Benefits to individuals include household savings from reduced vehicle maintenance and better access to alternative transportation, as well as better transit travel times and reliability. 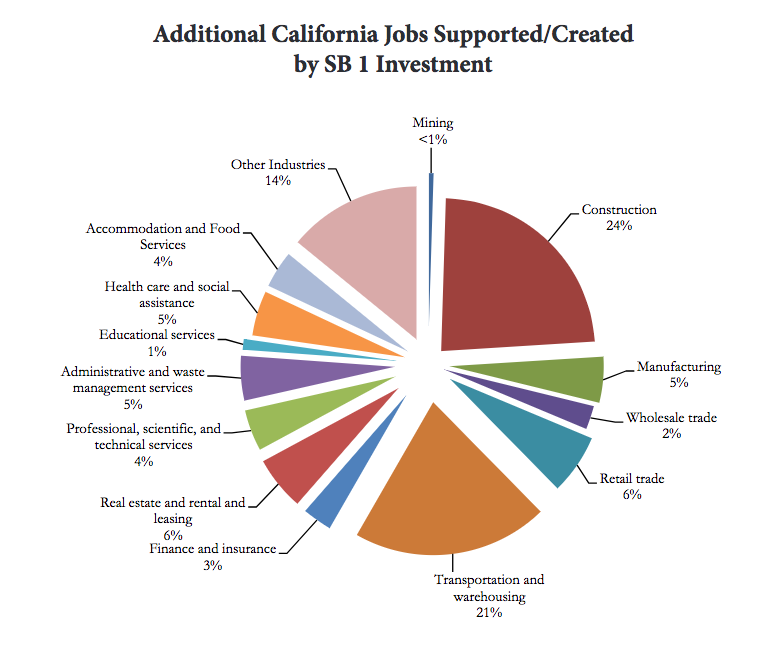 The new regional reports put numbers on benefits specific to Orange, Los Angeles, San Diego and Imperial counties, the Inland Empire, the San Francisco Bay Area, and the San Joaquin Valley. That’s not a bad return on an additional twelve cents a gallon and a realistic vehicle registration fee. And no, the gas tax is not the only–or even the main–reason gas is more expensive in California than elsewhere.